The American Comparative Literature Association is pleased to award the Rene Wellek Prize in literary theory for 1984 to Edward W. Said. 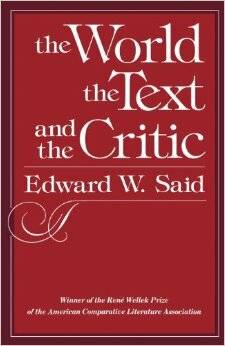 His The World, the Text, and the Critic (Harvard University Press, 1983) makes a significant contribution to our understanding of the connection between literary texts (and literary theory) and the social and political world o fht ehistorical moments in which they are located and interpreted. Through his brilliant theoretical and practical explorations of this connection, Said challenges us to rethink the critic's task in the fact of the actualitites of political power and authority within and outside the academy.